As an older woman we are often 'told' what we should and shouldn't be wearing, with the "ooh aren't you a bit too old to be wearing that" and the "I wouldn't wear it" comments. Why am I too old? Who said so? Why should I wear 'age appropriate' fashion? Age appropriate???? I'm not ready for twin-sets and pearls just yet even though I am rapidly approaching the BIG 5.0!!! Fashion has no age limit and I will wear what the hell I like. That feeling has been reinforced by the fabulous Catherine from Not Dressed as Lamb who is a total inspiration and encourages woman to wear what they like and shout about it. At the age of 47 I have given up worrying about what other people think and to be honest I've become more fashion conscious as I've gotten older funnily enough. And I love it. 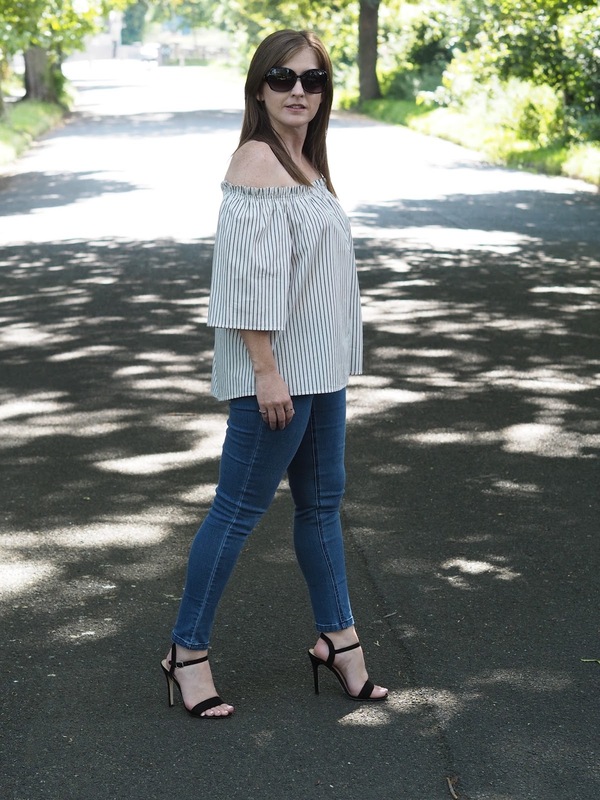 The lovely Catherine set up an Instagram campaign and weekly link up, #iwillwearwhatilike encouraging us to link up our fabulous style photos and posts and I was literally typing this very post up when her latest link up email came through and guess what it's for this week? 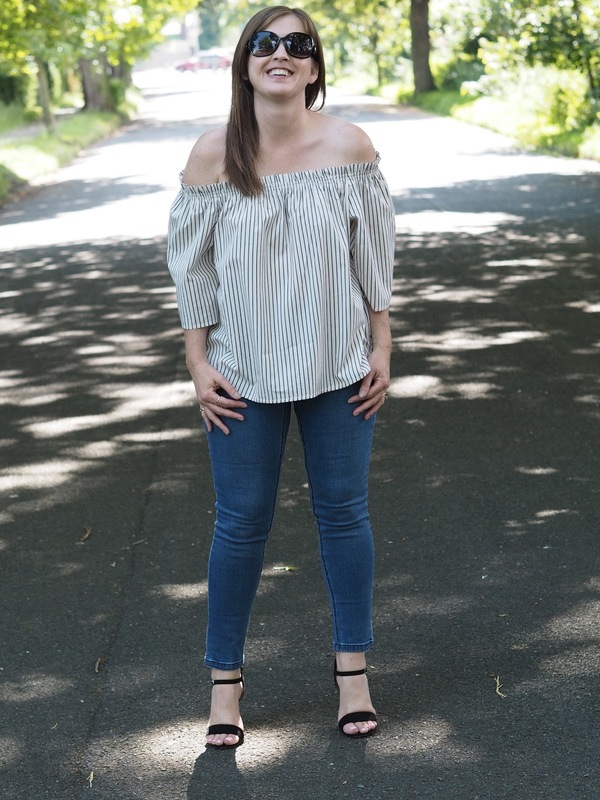 The cold shoulder and off the shoulder trend, I'm featuring both in this post so it couldn't be more appropriate! I choose whatever I feel comfortable in and if it looks good, it's flattering, enhances all my good points, and makes me feel great then it's a winner. I'm fully aware that I'm not as slim as I once was, and that, I don't like, but hey that's down to me and getting on that fitness train again (another post entirely) so sometimes I won't buy a certain item because of how I feel my legs look, certainly NOT because I'm too old to wear it. Hell, if I thought my legs looked good in a playsuit I'd wear it, regardless of my age! I keep an eye on the trends and shop in a variety of stores, including those thought of as the young persons stores, New Look and Topshop with a bit of Primark thrown in for good measure. H&M is one of my favourites and that's where these two tops are from. 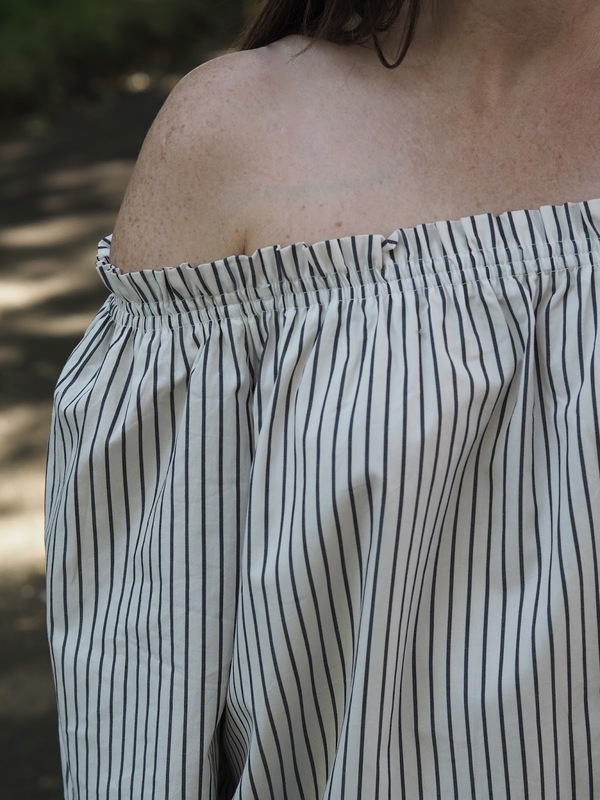 This first one, a pin striped off the shoulder top is so comfortable to wear and casual in style. I like my shoulders, I think they're one of my better features and love to show them off with this type of top, and I have a couple of off the shoulder dresses too! This one actually comes with thin shoulder straps but I didn't like them so I cut them off! The fabric is quite thick so you can get away with wearing no bra. I mean come on, what woman doesn't like being able to go bra-less? It comes in the pinstriped modelled by moi, plain white and a red floral little number. It's available in store or online here. Moving on to the cold shoulder top of which I have a few. Another style that's easy and comfy to wear. I have a couple that are more t-shirt fabric but this one is more of a blouse style and only available in the blue pin stripe. With it being a thin fabric it's slightly more noticeable that you're not wearing a bra (don't wear it on a chilly day if you get my drift) but you can't really wear a bra with the deep V at the front and back anyway, there's a few wobbles as you walk but hey, I just embrace it! You can find the details for this one here. By the way, the skinny ankle grazer jeans are from Joules and as I said in my previous bomber jacket post, they are a little on the tight side for my thighs but oh well, it may encourage me to ramp up my exercise regime a bit more. Maybe. Some 40+ women probably wouldn't dream wearing an off the shoulder or cold shoulder top but I say go for it. If you like it and you feel good in it then wear what the heck you like. Be YOU. Be STYLISH. Be INDIVIDUAL. If you fancy finding out more about Catherine's link up you can read all about it here, hey just get yourself over there to read her blog anyway, it's totally fabulous! Go for it!! You rocked them - and these tops are just too adorable!! I couldn't agree more with you about wearing what you want! You look absolutely fabulous in both outfits! I'll definitely be heading to h and m to check them out. You go girl, loved this post! A round of appalause to you Mrs! You look amazing. Not just amazing 'for your age', but amazing! I don't know who would dare be rude enough to comment and tell you any different, but they would be completely wrong anyway! You look much better than a lot of people half your age - and it really is just a number. The cold shoulder trend suits you! Its elegant but playful. Gorgeous! You can't go wrong with any of the stores you shop at. H&M is fast becoming a go to me too. Love the off the shoulder stripes. I'm 50 in a few moths & still wear what I like, gone are the days where woman have to dress 'age appropriate'. Happy to see so many women embracing fashion and style!